Find My Workspace lists over 95% of the serviced offices market in Newport (Sydney). Simply click Request Quote to check pricing for one office, or Add to Basket for multiple offices. 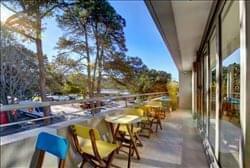 This creative co-working space on Sydney’s Northern Beaches boasts up to a 200mbps symmetrical fibre-optic cable for start-ups, individuals, small businesses and effective networking. Tenants can hire desks for small teams, individuals or start-ups. As well as this, there are facilities for conferencing, meeting room hire, events or simply to plugin, upload files and go! Office space includes Herman Miller Aeron ergonomic chairs, optic fibre connectivity, use of break out areas, and unlimited tea, coffee, filtered water. Come join this community in a shared office space and collaborate with like minded people while breaking the isolation of working from home. To obtain information for your selected Newport (Sydney) Serviced Offices, please tick the "Add to basket" box for each office you prefer and complete the form below. We will then send a detailed report via email.